RT:The main theme of the Davos forum in the past has largely been finding solutions for world economic problems. How about today? Is it still about that? RT:Mr. Norman, let’s talk about numbers. For example, this year companies have to pay $20,000 per executive for a ticket. A simple dinner in an average restaurant was $40 last year. A night in a mid-range hotel has gone from roughly $600 to $700. Do the Forum’s participants need all these special arrangements to make an effective decision? 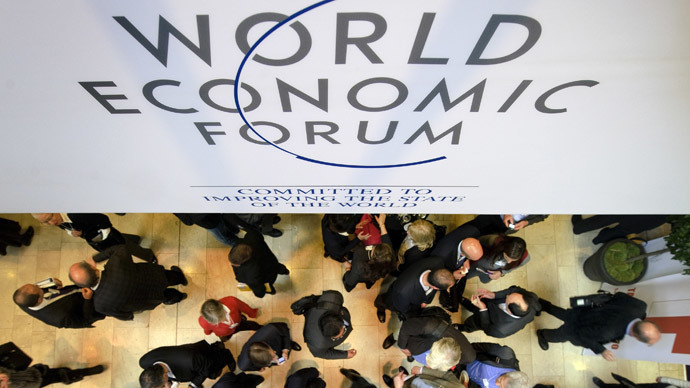 “[Davos] is a distraction but it is worse, it perpetuates this myth that somehow the world economy is made better by the elite gathering together and controlling and planning the world economy,” said Philip Booth, Institute of Economic Affairs, on World Economic Forum in Davos 2015. RT:This year's discussion of "The New Global Context" was meant to capture the post-financial-crisis reality of anti-globalization on the major markets and economies. And now that the oil prices have already fallen, and with all economies affected in some way by sanctions, don’t you think that it is too late for a meeting like that? LR: If the meeting was what it pretended to be - no, it’s never too late to have good discussions and learn something and perhaps come to some solutions. The people who attend meetings like this are the source of the problem. They are not looking at the full aspect; they are not looking to fix anything. And there are tremendous economic problems ahead with what’s happening to the euro, what the Swiss just did. There are all kinds of problems with the dollar, the ruble, the euro - all these currencies are having problems. The banks are having problems, people are getting poor in the US…We learn that from the government propaganda … but the standard of living [of regular Americans] is going down. And I can tell they don’t care about that in Davos, they just want to continue their own rip offs. RT:How do you see countries battling the global downturn? LR: I hope I’m wrong, but in virtually every single time that there is a recession - caused by central banking by the way, this just not come down to us like a rain from haven, these economic troubles are caused by central banking and by governments - typically what they do is they do everything wrong. Everything governments do in this kind of situation prolongs and deepens the economic troubles. Or they can start a boom again as the US has done. But that has horrendous results too. They will talk about trying to fix economic problems, they are making the economic problems but they are responsible for even worse. RT:What about the oil prices dip, how low can it go? What do you see for the future? LW: I guess that the oil price could go deeper... I myself don’t know much of it is economic causes, how much of it is political causes and it attempts to ruin Russia, to ruin Iran; and also there are people [who] want to get rid of all shale oil producers in the US, Saudi Arabia, and so forth. So how much is political, how much is an economic effect… but I think it is an effect on the world recession. There is a world recession going on, it is getting worse. We are going to see the other prices, commodity prices probably going down and the central banks are desperately trying to inflate which would make things even worse. But they seem to be having trouble doing it. There is real trouble ahead and the people who are making the trouble and the people who are coming up with alleged solutions are the criminals that are responsible for the situation as it is. People would try to study some economics, learn some real history, study some Austrian economics; they get to understand what is going on, why these guys are doing so much damage, and what we can do about it. But we can’t count on the power elite at Davos or similar kinds of meetings to fix things for us. Again they are the problem. RT:Why, do you think, many governments can’t find the solution to the current crisis situations? LW: Because all the governments care about is how it is going for the government. So they will tax and rip off their own peoples to an even greater extent so they can continue to live in style which has become a custom so their very high pensions can be paid, so they can have the limos, and all the rest of their fancy lifestyles. That is again all they care about, they will crash the people with taxes, with the police state, with more regulations to control for the benefit of the big banks, the big military contracts, they are going to start more wars because they are all Keynesians and they have the view of the evil John Keynes that the war is the benefit to the economy. War is not a benefit of the economy because it’s horrendous cost to the economy even leaving aside all the amount of sculls and destroyed property – the results from these wars. To start more wars is to hurt the economy, kill a lot of people. But of course the military contractors benefit, politicians benefit, people don’t benefit. This is the ancient story. Unfortunately, governments are far bigger today and far more influential than they have ever been in the history of the mankind. It’s not good. RT:What effect will the dip in oil prices have on the US economy? LW: It has a number of effects. It is good for consumers. The consumers can pay less for a tank of gasoline for their car. It’s a good thing. It’s not good for producers, especially for producers that have financed themselves with junk bonds and with other very risky means of financing. Some of those are going bankrupt... The oil companies are going to see their profits drop. But we don’t need to worry about that.